This image, captured in the first week of March, shows the sun in the midst of a flurry of eruptions. They say there's nothing new under the sun, but there is something completely new on it. For the first time, giant pillars of gas that light up and flame out "like candles on a birthday cake" have been spotted on the sun. Scientists at the U.S. Naval Research Laboratory (NRL) in Washington, D.C., discovered the odd, newly identified features — which they call coronal cells — by studying the sun's ultraviolet emissions at temperatures around 1.8 million degrees Fahrenheit (999,700 degrees Celsius). The pattern of cells, which have bright centers and dark boundaries, look similar to bubbles that rise to the top of boiling water, the researchers said. But, the scientists were surprised to find these features higher up in the corona, a part of the sun's atmosphere that is typically dominated by bright loops and dark coronal holes. Coronal holes are gaps in the sun's magnetic field that punch holes in the corona, allowing gas and solar material to escape into space. Neil Sheeley and Harry Warren, two researchers in NRL's space science division, examined time-lapse images of the sun from June 2011 and followed these coronal cells as they were carried across the solar disk by the sun's 27-day rotation. The central part of the sun's disk on June 17, 2011, seen from the Solar Dynamics Observatory in a coronal emission line (top) and a map of the surface magnetic field (bottom). Coronal cells are sandwiched between a dark coronal hole and the polarity reversal line of the field. Sheeley and Warren used data from NASA's Solar Dynamics Observatory (SDO), the agency's twin Stereo probes, the Solar and Heliospheric Observatory (SOHO), and Japan's sun-watching Hinode spacecraft to study these new solar features. The various spacecraft enabled them to study the coronal cells from multiple angles at the same time. "One of the wonderful things about SDO is the way the observations can be combined with other instruments," Dean Pesnell, SDO project scientist at NASA's Goddard Space Flight Center in Greenbelt, Md., said in a statement. "Combining data from SDO, STEREO, SOHO and Hinode lets us paint a picture of the whole sun in ways that one instrument can't." Coronal cells are found in areas between coronal holes and so-called filament channels that separate sections of upward-pointing magnetic fields and their downward-pointing counterparts. 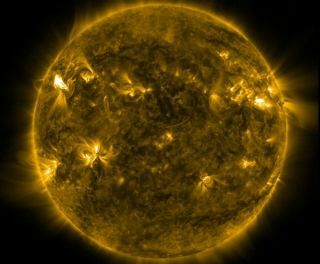 Understanding how coronal cells form and grow could give scientists new insights into the magnetic structure of the sun's corona, and how these cells affect the steady stream of solar material, known as the solar wind, that seeps from these holes, the researchers said. Sheeley and Warren superimposed images of the coronal cells on images of the sun's magnetic field to study their placement over the surface of the sun. They found that the magnetic field bundles lay centered inside the cells. The researchers also found that coronal cells were consistently found in regions dominated by magnetic field lines that point in a single direction (either up or down). They also noticed that when magnetic fields of the nearby coronal holes and the coronal cells were intricately tied. When the fields of the coronal hole were open, extending far into space without returning to the sun, the field lines in the cells were closed. The opposite was also true, the researchers added. Coronal images from June 10 to June 17, 2011, showing that the cells change to elongated plumes when seen in perspective. "Sometimes the cells were gone forever, and sometimes they would reappear exactly as they were," Sheeley said. "So this means we need to figure out what's blowing out the candles on the birthday cake and relighting them. It's possible that this coronal cell structure is the same structure that exists inside the coronal holes — but they're visible to us when the magnetic fields are closed, and not visible when the magnetic fields are open." The researchers also examined historical data and did not find coronal cells in 1996 or from 2008 to 2009, during an extended period of subdued solar activity called the solar minimum. They did find numerous coronal cells around 2000, when the sun was ramping up in solar weather activity, and developed more active sunspot regions. Future studies of coronal cells could improve scientists' understanding of the magnetic changes at the boundaries of coronal holes, and how these structures influence the solar wind and resulting affects of space weather on Earth. Detailed results of the study were published online in the Astrophysical Journal on March 20, and will appear in a print issue on April 10.